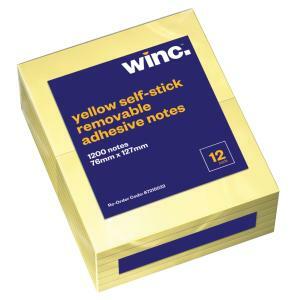 Winc Self-stick notes are yellow with repositionable adhesive on the back that are deal for every desk or workstation in your office. Value for money, these notes can be repositioned without leaving a trace. 100 sheets per pad with 12 pads per packet. Dimensions are: 76(h)x126(w)mm.